Convenient source of UV light. High Standard of manufacture with metal outer casing. 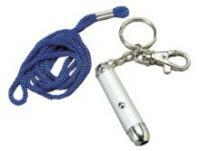 Supplied with keychain and hand strap. CAUTION: UV Light can be dangerous. Do not expose the skin or eyes under the light source. Keep out of the reach of children. Approx. Dimensions: 57mm long x 12mm Diameter (Excluding Keyring). The new Bullet Light is a durable aid in detecting u.v. marked property such as mobile phones and for authenticating currency, credit cards, passports, M.O.T. certificates Driving Licences and other U.V. marked documents. This UV Torch is ultra conveniet too as it incorporates a neck strap so can be worn unobtrusively. Upgraded 375nm wavelength even tests Smart Water.